Help! I didn't realise it but I am in serious danger of becoming an art supply junkie! While looking for the soft pastels for my previous two posts Pondering and Happy New Year, I found lots of art supplies that I bought or was given at one time or another. I am getting quite a stash so it seems. Are your art and craft items spilling into other areas of your home? Need more storage? Can you resist the temptation of the latest must have art item? The newest colour? The email telling you there is a sale on in your nearest craft store? If the answer is Yes! Then I am afraid you are on your way to becoming an art supply junkie also! And how did this happen? Well... I am sure I am not the only one that loves the look and smell of all those scrumptious colours no matter what the art material and what about the names! Cinnamon, watermelon, cherry pie, lemon zest. Just good enough to eat, although I wouldn't recommend it! This year I will attempt to take advantage of those supplies and incorporate them into my art. Not all at once mind, now that would be a challenge. 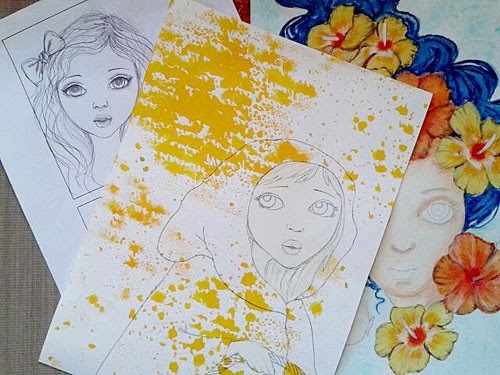 While I was knee deep in the art supplies, I came across unfinished art pieces. I thought I would breathe new life into them or at least attempt to finish a few. I get very easily distracted, so focus and commitment seem to be my words for this year. Frida Kahlo sang the loudest to me, as I imagined a wall behind her with lots of texture and a perfect excuse to use the texture paste. Colours of Frida's Mexican heritage seemed fitting. I mixed a few drops of teal fluid acrylic paint into the texture paste and then spread this with a palette knife in the background. A heat gun finished the look off. 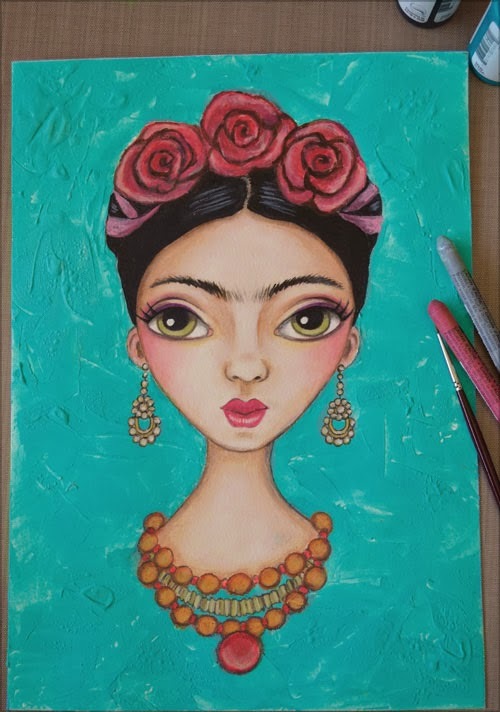 Frida was painted in acrylics and caran d'ache watersoluble crayons. Graphite pencil was used for definition. 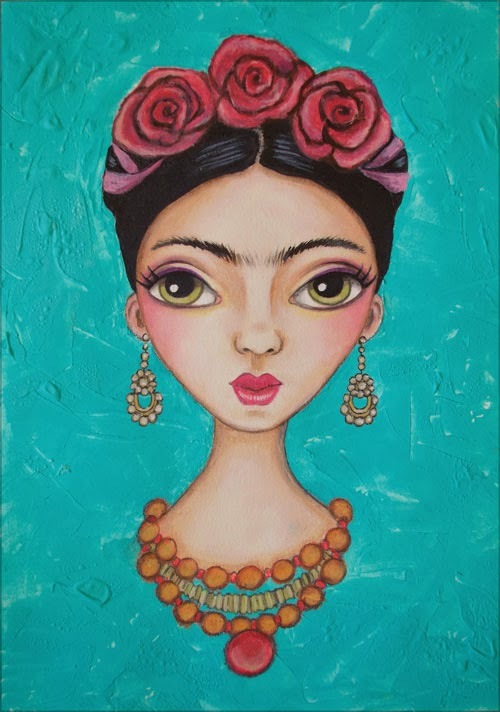 It felt good to finish Frida and I love the way she turned out, I hope you do too. 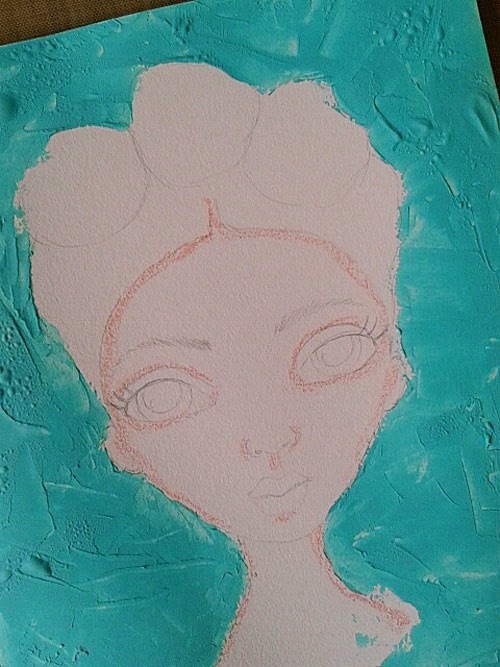 What are your tips in keeping yourself in check when it comes to art supplies and staying on track with projects? I'm so glad Frida spoke to you to be completed! She is gorgeous!!! You are very kind Dana, thank you. I notice sometimes it is better to come back to a project with renewed energy and eyes, rather than getting frustrated when things aren't working out. I'm so in love with Frida's face!! Just beautiful!